Can't get enough of South America? Well your about to heighten your senses in Cartagena. No doubt the best Bachelor Destination when rating quality of fun, talent, service and price. Cartagena has catapulted itself to the forefront for Guys Getaways. With everything to offer Beaches, Yachts, Day and Nightlife and fine foods you will spend more time trimming down your agenda rather than adding to it. Located on the northern front of Colombia bordering the Atlantic the City of Cartagena is known for its hot weather, ocean front living and historical past. A premium vacation destination for all travelers Cartagena has a good flow people through its streets most of the year with the busiest times being in December and February. When planning a Bachelor Party Trip to Cartagena securing a residence for you stay is imperative. The popular ares of Cartagena include BocaGrande to the South, Centro (Walled City) & Morros Beach to the North. Depending upon your experience and group size any of these locations would be satisfactory. For First Timers and Bachelor Parties we recommend securing accommodations inside the Walled City. Here you will have the ability access 5 star restaurants, night clubs and activities mostly within walking distance. There are a number of units on AirBnB and VRBO that can sleep parties of up to 30 comfortably but prior to booking make sure they are ‘Partying Approved'. All the properties listed on our website are suitable for partying, loud noise and having additional guests. The walled city is well situated to all the actives and parties happening in Cartagena. The only time you will need to take and extended trip in a car is if your looking to play Golf, Tour or Drive to outside ports to capture a yacht. Day actives are plentiful there is always the beach where you will find other vacationers taking in sun or you can be more adventurous and try some water actives including Fly Boarding, Jet Skiing, Kite Surfing and Boating. All the activities on located on the main beaches of Morros about 15 minutes north of Centro. If laying on the beach isn't your thing you do have a few options and if you want it to involve day time partying your going to be the one responsible for making it happen. There is a Pool Party on Sunday's in Morros Beach and its good however like most bachelor parties you are in Cartagena for the weekend and you only have Thursday, Friday and Saturday with free time during the day. So we propose creating your own Pool Party, Yes we will bring the Guests, Lighting, DJ's, Food and Supporting Cast to make it memorable. The party gets started around 2pm and continues on through the night as long as the guys are involved the supported cast of actresses are always down for a good time into the after hours. Another high end service to hire is a Yacht Charter. Instead of hosting your pool party at an apartment or beach bungalow enjoy the private meeting of floating on the bay with a boat full of babes. 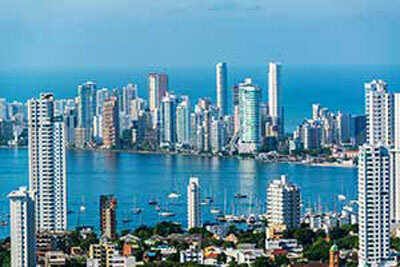 Yacht Charters give the full experience of what Cartagena can offer. You see the City, the remote islands and explore nature of the seas that surround the archipelago. Yacht Charters are available from 4 - 10hrs and can be as inclusive you require to ensure every details is managed from the time you set sail to returning to your mansion. Preview our list of yacht for rent ‘Here' and we are happy to provide you with an instant quote on the price and services that are available for your event. The Cartagena Party Boat has all of the state-of- the-art technologies and features you would expect in a yacht of this caliber. Inside you will find the latest advances in maritime navigation technology, as well as a high powered motor that easily helps the yacht cruise along the Caribbean to the destination of your choice. If you want to get off the boat and stretch your legs for a few hours, ask the captain to bring you to the islands del Rosario where you can enjoy the amazing coral reefs, white sand beaches, and palm trees that create the perfect tropical island.